How FL Crash Victims Can Get Pain and Suffering Awards | DeLoach, Hofstra & Cavonis, P.A. Can I receive damages for pain and suffering after a Florida car crash? Pain and suffering is the legal term for an additional amount of damages that are paid on top of medical and disability costs, and it's up to a jury to decide how much should be awarded in each case. When Can Florida Victims Be Compensated for Pain and Suffering? Florida has rules regarding who may and may not be awarded pain and suffering damages in an injury case. As Florida is a no-fault insurance state, drivers are required to file claims with their insurers to collect the costs of an accident, regardless of who caused the crash. If these claims aren't sufficient to cover the costs of injury, an accident victim may sue the at-fault driver or another negligent party whose actions led to the injury. Victims may be awarded two kinds of damages in car accident cases: economic damages and non-economic damages. Economic losses are costs that can be totaled, such as medical bills and lost wages. Pain and suffering awards are a form of non-economic damages, and aren't easy to quantify. Depending on the degree and severity of the injury, the extent of medical treatment, and the impact of the accident on the victim’s life, non-economic damages may range from a few thousand to several million dollars. Physical suffering. This is meant to compensate a victim for the trauma at the time of the injury; the pain throughout the recovery process; and any discomfort he or she will suffer in the future. Mental anguish. 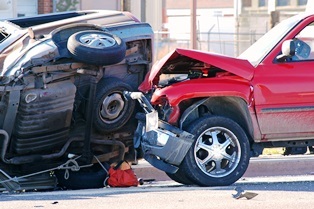 Victims suffer a wide range of psychological effects after an accident. The stress of paying medical bills, the fear and embarrassment of living with physical restrictions, the anger of having to deal with a new problem every day, anxiety and depression throughout recovery, and lingering symptoms of post-traumatic stress disorder (PTSD), can all qualify as emotional pain and suffering. Other non-economic loss. Accident victims may sue for the injustice of the accident and inconvenience of having portions of their lives taken away. Common effects of a sudden and traumatic crash include disability, loss of fertility, loss of a family member, and lost enjoyment of life. A jury has to consider many different factors to determine how much should be paid to an accident victim for his or her suffering. Two people injured in the same crash can be awarded vastly different amounts, depending on their personal circumstances. For example, a victim who is retired to a wheelchair after the crash, may be awarded a significant sum, if he or she was very active before the accident. On the other hand, a victim who had suffered a pre-existing injury to the same part of the body, may see a reduced award, unless his or her attorney can prove that the damage from the accident played a significant role in her suffering. At DeLoach, Hofstra & Cavonis, P.A., we can examine all of the details of your case to maximize the amount of your pain and suffering award. We'll carefully review the change in your activities, career path, medical treatments, family situation, and future prospects, securing the rightful compensation fo you, to put the accident behind you. And we don't collect any fees until your case is won. Simply fill out the quick contact form on this page to set up your consultation.